There was an awful sound outside tonight, of some animal screaming in pain. 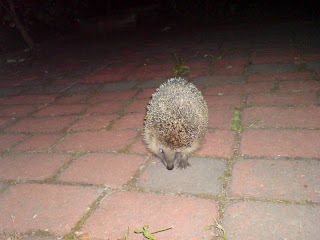 I went out to investigate and some teenages were panicking by the side of the road. Aparently they had shooed away a Badger that was attacking a hedghog, and were very nervous of the Badger! I didnt see it, but the hedghog was lying there screaming, a really weird noise (I now belive that my stange beast in Denmark was probably a hedgehog). Anyway, I wrapped it up in a blanket and was gonna take it to the Veterinarian School (they have a 24 hrs service). Hilde called them and said that they would take it, but only to put it down. So we decided to wait till morning and see if it had died. 15 minutes later its was up and happily running about in the yard… Here it is coming over to say thanks before running off into the night! Here is a new film, Shot last Winter at Sognsvannen in Oslo. It starts slow with film of crows in a tree, then gets fast as we walk for 2 hours around the lake, then, after a long cold day, I relax at home. A typical Norwegian Winters Day. The Music is taken from my 2005 album Ear Nose and Throat, and is called “And” Available on CDR with lavishly printed grotesque sleeve from this sites very boutique, or from your friendly neighbourhood ITunes Store. A film made on my phone while on holiday in Denmark. Nikolas makes his first film. I have also uploaded the first film from my 2 and a half year old son. Everything was shot by him on a stills camera and I helped him make the photos into a movie. There is The Beast, a very scary horror film shot in Denmark. It is based on an experience I had while recording some audio on my new H4 recorder. I had heard the neighbour playing violin faintly from the next door Holiday Chalet (we were on holiday) and while recording I heard a rustling in the tres to my left… Suddenly there was a low growl and I ran… accidentally stopping the recording as I went. Heres the recording. And here is the film.